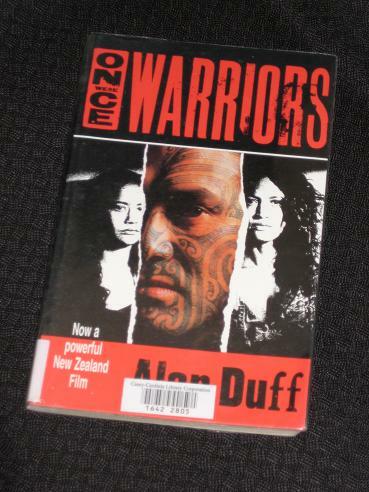 Once Were Warriors is an extremely popular New Zealand film, but the fact that it was originally a book is probably less known. Alan Duff’s novel is a searing exposé of the myth of racial harmony in New Zealand, portraying the life of the Maori underclass in a small regional town. From first page to last, it grips the reader, pushing them into places they would rather not go, making them wonder what exactly has hapepned to a proud race of people. With no work, and little prospect of any, people spend their days wasting what little money they have on cigarettes and alcohol, unwilling and unable to put a little aside in the vain hope of improving circumstances. In the first chapter, Beth makes the staggering discovery that her house is bookless, with not a single real book to be found from top to bottom – a symbol of the hopelessness of her situation. The only other place the locals can look to restore their pride is their heritage, but the reality is that this new suburban underclass has lost its ties to its tradition. When they left their villages, they abandoned their culture and their language, and now they are caught in a no-man’s land, stranded between the Maori society they have voluntarily left and the white culture they will never be a part of. Last year I read Witi Ihimaera’s The Rope of Man, two collected novels which also dealt with the issue of Maori tradition and the importance of keeping a hold of it in modern society, but where Ihimaera’s work was largely positive, Once Were Warriors is savage in its negativity. It’s over twenty years old now, so perhaps things have improved in New Zealand, but if this is (or was) a reflection of reality, it’s a sobering one. One path to take out of the mess is to embrace the violence and join one of the local gangs, a choice one of Jake’s sons decides to make. The gangs are a law unto themselves and represent a substitute for the traditional extended Maori family. However, there is always another – a better – path to take, and that is to return to traditional values and embrace the past. By working as a community, the individuals can take strength from shared numbers, and by the end of the novel, this seems to be the path Duff is suggesting his people take. I have heard so mcuh about this book, I really should get a copy of it. Maybe for next year's Indigenous Literature Week! A great review Tony of a very important piece of writing in New Zealand. It is brutally honest about a sad and violent life style that does exist in our communities. However this is just one perspective. There are many who are seizing the opportunities presented and yes Witi Ihimaera's writing reflects his experiences. I guess this is what this Indigenous Reading Week is all about. Thanks Helen 🙂 I agree that there are many views, and that not all Maoris will have this sort of existence, but I thought this book was particularly interesting as we have a bit of a rose-tinted view of Maoris from abroad. 'Once Were Warriors' shows us that NZ has racial issues, just like any country. A great review, Tony. This is one of my all-time favourite books — I read it YEARS ago — but whenever I mention it to anyone they look at me blankly. No one even seems to know the film, which, by the way, is terrific and slightly more optimistic than the book. Sadly, the author seems to have got himself into trouble recently… I believe he declared himself bankrupt last year.